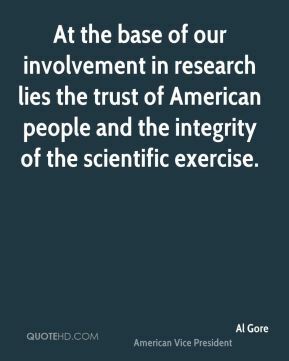 At the base of our involvement in research lies the trust of American people and the integrity of the scientific exercise. It's a scientific wonderland for atmospheric scientists. 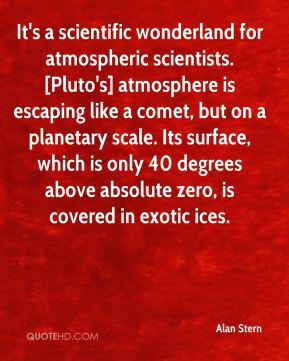 [Pluto's] atmosphere is escaping like a comet, but on a planetary scale. Its surface, which is only 40 degrees above absolute zero, is covered in exotic ices. 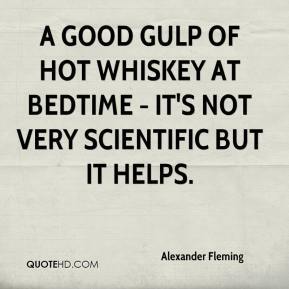 A good gulp of hot whiskey at bedtime - it's not very scientific but it helps. It showed that our country was capable of making a scientific discovery of global importance. We forget that we use the results of space exploration everyday. 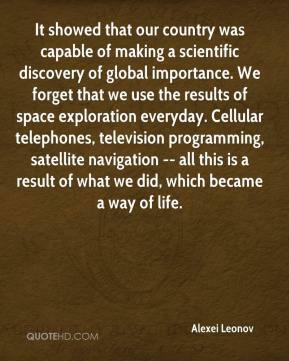 Cellular telephones, television programming, satellite navigation -- all this is a result of what we did, which became a way of life. 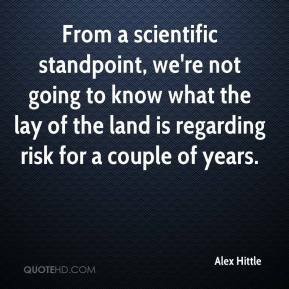 From a scientific standpoint, we're not going to know what the lay of the land is regarding risk for a couple of years. 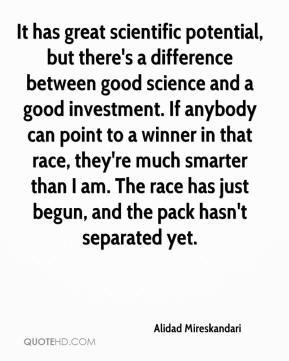 It has great scientific potential, but there's a difference between good science and a good investment. If anybody can point to a winner in that race, they're much smarter than I am. The race has just begun, and the pack hasn't separated yet. 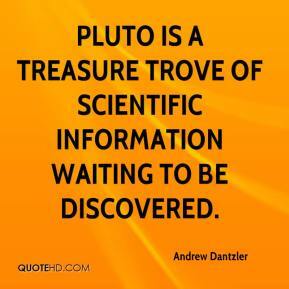 Pluto is a treasure trove of scientific information waiting to be discovered. 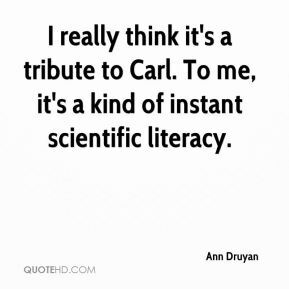 I really think it's a tribute to Carl. To me, it's a kind of instant scientific literacy. 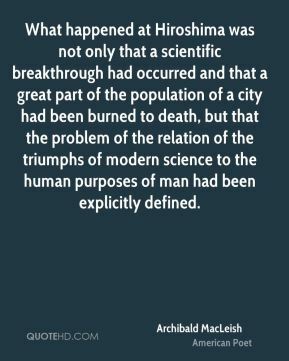 What happened at Hiroshima was not only that a scientific breakthrough had occurred and that a great part of the population of a city had been burned to death, but that the problem of the relation of the triumphs of modern science to the human purposes of man had been explicitly defined. 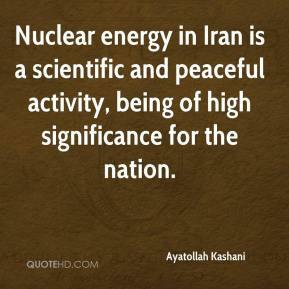 Nuclear energy in Iran is a scientific and peaceful activity, being of high significance for the nation. 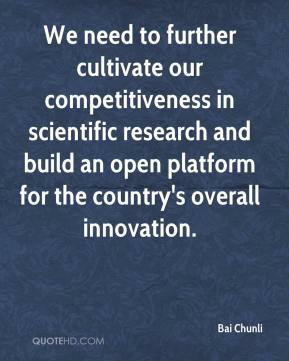 We need to further cultivate our competitiveness in scientific research and build an open platform for the country's overall innovation. The medical, scientific process is open to any drug. That includes marijuana. 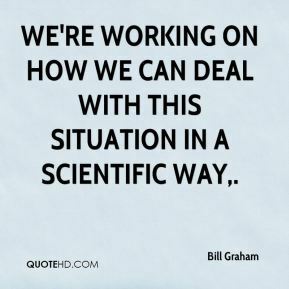 But you have to get through a process and demonstrate scientific validity. And in this case, to be honest, I think it's nonsense. 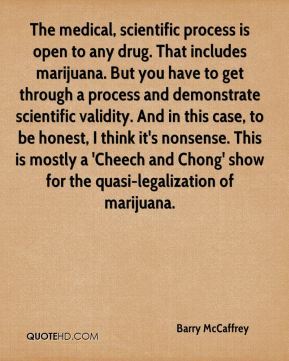 This is mostly a 'Cheech and Chong' show for the quasi-legalization of marijuana. 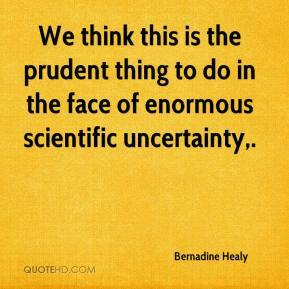 We think this is the prudent thing to do in the face of enormous scientific uncertainty. 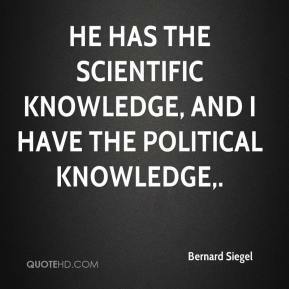 He has the scientific knowledge, and I have the political knowledge. We're working on how we can deal with this situation in a scientific way. 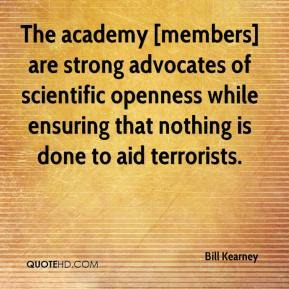 The academy [members] are strong advocates of scientific openness while ensuring that nothing is done to aid terrorists. The creation of this Board, separate and distinct from Alba's Scientific Advisory Board, will provide streamlined guidance related to regulatory and clinical issues. 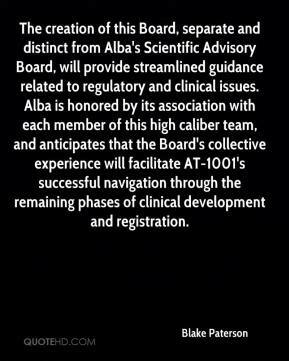 Alba is honored by its association with each member of this high caliber team, and anticipates that the Board's collective experience will facilitate AT-1001's successful navigation through the remaining phases of clinical development and registration.